The IAS aspirants should study the most authentic sources for the Current Affairs section of the IAS Prelims Exam as current affairs hold great significance in the ias prelims exam. Hence, we provide Current Affair quiz based on the latest socioeconomic policies of February 2017 from the most authentic sources like pib and pti for IAS Prelims 2017. Current affair in the IAS prelims exam has achieved greater significance in the last few years. This is the most critical part of ias prelims as well as ias mains Exam. In fact, all the questions in ias exams are drafted around current affairs. 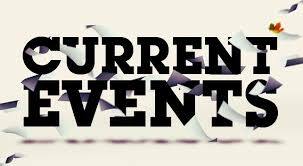 The Importance of Current Affairs in ias exam is immense. Aspirants should study in depth to understand the significance of current affairs for UPSC. 1) Zealandia is a nearly submerged continental fragment. 3) It is the world's largest current microcontinent. 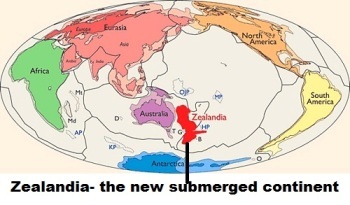 Zealandia is also known as the New Zealand continent, or Tasmantis, is a nearly submerged continental fragment that sank after breaking away from Australia having separated from Antarctica between 85 and 130 Ma ago. It may have been completely submerged about 23 Ma ago and most of it (93%) remains submerged beneath the Pacific Ocean. Zealandia supports substantial inshore fisheries and contains New Zealand's largest gas field, near Taranaki. Permits for oil exploration in the Great South Basin were issued in 2007. Offshore mineral resources include iron sands, volcanic massive sulfides and ferromanganese nodule deposits. It is the world's largest current microcontinent, more than twice the size of the next-largest microcontinent and more than half the size of the Australian continent. As such, and due to other geological considerations (such as crustal thickness and density), it is arguably a continent in its own right. 1) Barren Island is an island located in the Arabian Sea. 2) Barren Island is the only confirmed active volcano in South Asia. 3) Barren Island stands in the midst of a volcanic belt on the edge of the Indian and Burmese tectonic plates. India's only live volcano in the Andaman and Nicobar Islands has started spewing smoke and lava again. After lying dormant for 150 years, Barren Island volcano erupted in 1991 and has been showing sporadic activity Barren Island is an island located in the Andaman Sea. It is the only confirmed active volcano in South Asia. Along with the rest of the Andaman Islands, it is a part of the Indian Union Territory of Andaman and Nicobar Islands, and lies about 138 km (86 mi) northeast of the territory's capital, Port Blair. This volcanic island stands in the midst of a volcanic belt on the edge of the Indian and Burmese tectonic plates. Narcondam Island is a dormant volcano in the area, apart from volcanic seamounts like Alcock and Sewell. All the historical and recent eruptions are confined within and around an active polygenetic cinder cone in a 2 km wide caldera that was formed by the Pleistocene collapse of a primitive cone of a stratovolcano. 3. The Government announced the expansion of the Rotavirus vaccine under its Universal Immunization Programme (UIP). Which of the disease vaccination is not included under the UIP? India’s UIP provides free vaccines against 11 life threatening diseases, to 26 million children annually, the largest birth cohort in the world. The Universal Immunization Programme provides life-saving vaccines to all children across the country free of cost to protect them against Tuberculosis, Diphtheria, Pertussis, Tetanus, Polio, Hepatitis B, Pneumonia and Meningitis due to Haemophilus Influenzae type b (Hib), Measles, Rubella, Japanese Encephalitis (JE) and Rotavirus diarrhoea. (Rubella, JE and Rotavirus vaccine in select states and districts). The government has announced the expansion of rotavirus vaccine in five additional states under its Universal Immunisation Programme (UIP). Now, the vaccine will be expanded to Assam, Tripura, Madhya Pradesh, Rajasthan and Tamil Nadu. The vaccine will prevent Rotavirus diarrhoea in children, which accounts for approximately 40% of hospitalizations from diarrhoea in India. Diarrhoea is one of the biggest killers in children and rotavirus is one of the most common causes of severe diarrhoea in children less than 2 years of age. I. The bill aims to check ‘show of wealth’ and wants those who are spending above 5 Lakh in a wedding to contribute towards marriages of poor girls. II. If a family intends to spend more than 5 lakh on a wedding, then, it will contribute 10% of it to a welfare fund established to assist poor families in the marriages of their daughters. The Marriages (Compulsory Registration and Prevention of wasteful expenditure) Bill, 2016 seeks to put a restriction on extravagant spending in weddings in the country by limiting the number of guests and number of the dishes in the menu. The bill aims to check ‘show of wealth’ and wants those who are spending above 5 Lakh in a wedding to contribute towards marriages of economically poor girls. The main objective behind its introduction is to prohibit extravagant and wasteful expenditure on marriages and to put into effect a simpler and much cheaper process. The Bill also seeks that “if a family intends to spend more than 5 lakh on a wedding, then, it will have to declare the amount proposed to be spent in advance to the appropriate government body and contribute 10% of it to a welfare fund established to assist poor families in the marriages of their daughters. I. The GST compensation law, that if a state has a loss, then for the first five years they will be compensated. II. The Council had agreed that 90% of tax assesses below Rs 1.5 crore annual turnovers will be assessed by states and the remaining 10% by the Centre. Moving towards the rolling out of GST, the GST Council has recently approved a law to compensate states for any loss of revenue from the implementation of the new national sales tax but deferred approval for enabling laws to the next meeting. The Council, in its last meeting on January 16, had agreed that 90% of tax assesses below Rs 1.5 crore annual turnover will be assessed by states and the remaining 10% by the Centre. For taxpayers with over Rs 1.5 crore turnover, the split was 50:50 between the Centre and the states.